When Michelle Schwartze arrived for a tour of Missouri S&T, students kept interrupting her guide, Dr. Larry Gragg, Curators’ Distinguished Teaching Professor emeritus and former chair of history and political science, to say hello and talk with him. Those interactions drew her to S&T. “Teaching Math in Elementary and Middle Schools” at Missouri S&T. 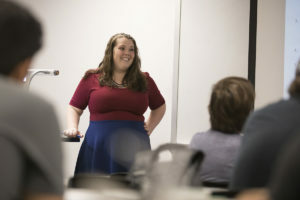 Schwartze is helping prepare the next generation of K–12 teachers in the teacher education and certification department, and she says the Missouri S&T faculty exhibit many key elements of good teaching. At an active‑learning day on campus, she saw classroom videos other faculty members had made. Some faculty members are rethinking the large lecture-hall style of teaching students at the college level. Dr. Amardeep Kaur earned two electrical engineering degrees from S&T before joining the faculty. 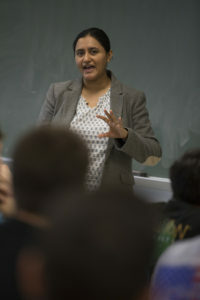 Amardeep Kaur, an assistant teaching professor of electrical and computer engineering who earned master science and Ph.D. degrees in electrical engineering from S&T, says it was a challenge, at first, teaching electrical circuits to 200 students who are not all electrical engineering majors. She improved student engagement through feedback from colleagues. The result is less lecture time and a more interactive classroom experience — a partially “flipped classroom” where students learn some content on their own before class. Her students say her teaching style is to make sure they know the material inside and out. That could be because it hasn’t been too long since Kaur was a student herself. Kaur says S&T’s pride in diversity and inclusion makes students, faculty and staff all feel like they belong in Rolla. Dr. Sarah Hercula teaches linguistics courses in English and technical communication at Missouri S&T. 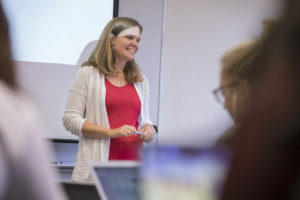 Sarah Hercula, assistant professor of applied linguistics, started out teaching high school before deciding she wanted to teach at the college level. She sees herself more as a facilitator of learning than as a transmitter of knowledge. One of her students, Lindsay McNamee, says Hercula challenged her to search out and follow evidence to reach her own conclusions in her classwork. Hercula says that faculty see teaching as their top priority at Missouri S&T. Schwartze, Kaur and Hercula all pointed to relationship-building as key to student learning. One way S&T faculty are building those relationships is by taking time outside of teaching hours to help advise students through design teams, student organizations and extracurricular activities. Kaur advises the student chapter of the Institute of Electrical and Electronics Engineers (IEEE), a large professional organization dedicated to advancing technology to benefit humanity. She’s also helped international students feel welcome by advising the India Association for two years. This story illustrates one of the main reasons that MO S & T is underrated by surveys. Rolla provides the right atmosphere and size to soak up the difficult technology of today. We do compare well with other institutions, even those of much greater financial wealth and class size. However, the personal attention and friendliness is a great selling point because the quality of the time given to students is remarkable and cannot be captured by a mere survey.